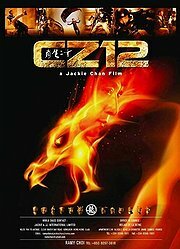 CZ12 (or “Chinese Zodiac”, as it is also called, because some Chinese zodiac sculptures looted from the Beijing Summer Palace serve as McGuffin) is not a good film. By no category or definition. Now I have never been a fan of Jackie Chan’s “oeuvre” in any way, and do not find the least bit of pleasure in the effort of Chinese and Hongkong movie industry to find new ways of making people of all ages, genders and physical skills bounce about in their martial arts varieties and get roped around “like a feather” (which in all cases that I actually did see looked as light as meat chunks on the butcher’s hook. And I know what I’m talking about, butchers in the family and all…). When you combine this with what I dare to call a “Chinese sense of humour” (i.e. excessive use of slip-on-banana kind of slapstick, pulling faces in front of an automatic camera while being kicked in the balls by a camera tripod, blatant use of homosexuality references, etc. etc. ), then … it’s really not my piece of cake. This means “CZ12” never stood a chance of being liked by me. No problem, but for what it is, is it well done? Nope! The film adds to its own misery by doing what it’s doing in a surprisingly amateurish way: Its action power is basically exhausted after the opening sequence involving some full-body-rollerskating escape, which is so poorly directed that it was painful to watch. After that: a bit of change of scenery, some girls screaming so as to be rescued by the brave heroes, some girls talking about their underwear, some girls pulling each others’ hair. Some old men pretending they are still very good at fighting very young men. Some international actors who clearly do not know what they signed up for (Oliver Platt, please, have a word with your agent, or is business really so dire? If you need a job, call me!). I watched the film even though I knew this is not my genre, expecting at least some production values and some of China’s and Hongkong’s most experienced directors and actors at work. I would need to check whether “CZ12” and the recent “Journey West” are among the most expensive Chinese movies ever made. If this is the case – and I believe it is – then this tells a very sad story about the technical and narrative skills of the Chinese film industry. The involvement of the international setting (travelling from Paris to China to Vanuatu (I am told by Wikipedia) and some more) and a bunch of international actors is certainly aimed at opening the international markets. Really? With this?? ?